The first time we left BJ's for some dirty riding the morning was pretty cold and my legs were pretty flat. After I snapped a joining link in my chain mid trail and we rolled back to BJ's garage to fix it, well the second start was great. The sun had knocked the mercury above 6° and my legs had had a little bit of a roll to get them moving. We (BJ, Craig Peacock and I) looped our way our through the Mullem Mullem Creek trails, through those in Park Orchards and on to the ones in the back of Warrandyte. The pace was never too hot, as the damp clay based earth, and perpendicular pine roots were always eager to punish indiscretions. In short, it was a good morning, to be on fat tyres with a couple of like minded dudes. 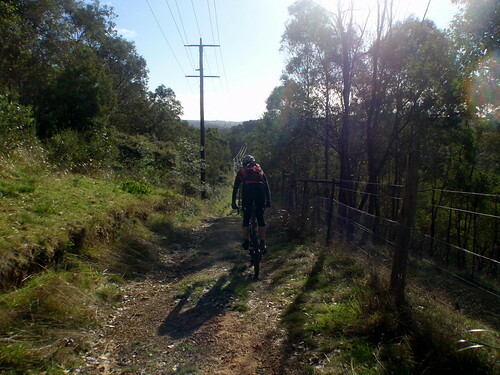 The flatter early trails gave way to longer climbs in Warrandyte, which I took as an opportunity to stretch my legs out and see how a few weeks without a road bike and any serious climbing had left them. The signs were pointing to "yeah, not too bad" and I was happy about it. Craig peeled off early to keep from over extending an injury leaving BJ and I to loop back through some trails on the way home. The longer climbs gave way to steeper climbs, culminating in a fire road somewhere in Currawong Bush Park, that Strava tells me topped out at 51.8% gradient. That burnt a match, or possibly all of them. Refilling our bottles and eating a bar a few minutes later, I had to admit to Brian that it might have resulted in me being running close to empty. Thankfully he agreed to turn us home, after "just one or two quick detours".